Accumulate has some good news stories to share with you! Accumulate Good News Story 1. Accumulate entered a t.shirt collaboration with the wonderful Hopeful Traders. Hopeful Traders are a social enterprise that create and sell t.shirts using designs by homeless people and then they give a share of profits to charities dealing with homelessness. So it seemed a pretty obvious, that Accumulate should team up with Hopeful Traders and produce this beautiful, cool and groovy t.shirt. Accumulate Good News Story 2. We also have been busy bees producing products for the Accumulate Pop Up Shop within a pop up shop at Youth Club Archive, 3, Carnaby Street, London W1F 9PB. 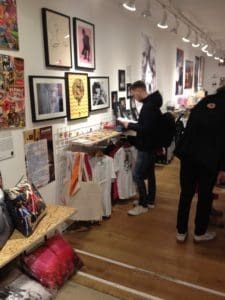 The Youth Club Archive shop is a celebration of all things connected to Youth Culture, with a huge archive of photographs documenting the different subcultures such as punk, rockabilly, ska, skinheads, grime etc. 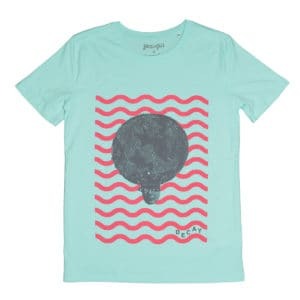 We have created a range of Accumulate products for the shop including t.shirts, tote bags, badges, art prints and posters. The Accumulate products use artwork created by residents at the Evolve Hostel in Stockwell when they participated in the Accumulate DECAY zine workshops. Accumulate Good News Story 3. And then to top it all off we were very lucky, grateful and honoured to receive funding from the RSA Catalyst Fund to support the development and commercialisation of Accumulate products. The fund will enable us to increase the range and sales of Accumulate products designed by young people who are homeless and who attended our workshops. Through this development, we can provide an income to the Accumulate artists, who will get a share of the profits generated, build greater awareness of Accumulate and what it sets out to achieve, and, most importantly, provide an independent source of revenue so that we can increase our services and impacts, and reduce any dependency on grants and donations. Accumulate Good News Story 4. 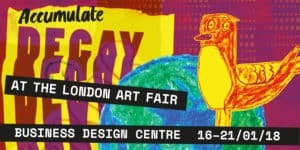 And then finally, we are looking forward to the DECAY at The London Art Fair exhibition. This Accumulate exhibition will showcase all the creativity produced on the DECAY 2 workshops with the Evolve hostel residents. And what’s even more exciting is that the exhibition will be within the prestigious London Art Fair – and that’s a great, big, good news story to end this year on! many thanks to the fantastic Briffa law firm and also the wonderful Ravensbourne for sponsoring the DECAY at The London Art Fair exhibition. HAPPY HOLIDAYS AND A HAPPY 2018 TO EVERYONE! One Festival of Homeless Arts and The Quilt of Homelessness. Accumulate starts 2018 full of creativity!